This site was last updated on 24 June 2015. This site is about the restoration of a 1976 Fisher 30 ketch-rigged motorsailer, hull #129, now located in Central Maine, USA. Under previous ownership, the boat sank in 27' of water in the Hudson River in either 2007 or 2008. She was subsequently salvaged, cleaned of most of the river filth, and placed in storage for a time before she was put up for sale in June 2010, when I bought the boat after finding an advertisement online. Other than the obvious problems caused by the sinking, the boat was generally structurally sound, but she would require completely new systems, new engine, various cosmetic upgrades, and, for our needs and desires, a slightly revamped interior plan. Over a nearly five-year period, punctuated by several long stretches of inactivity (why? 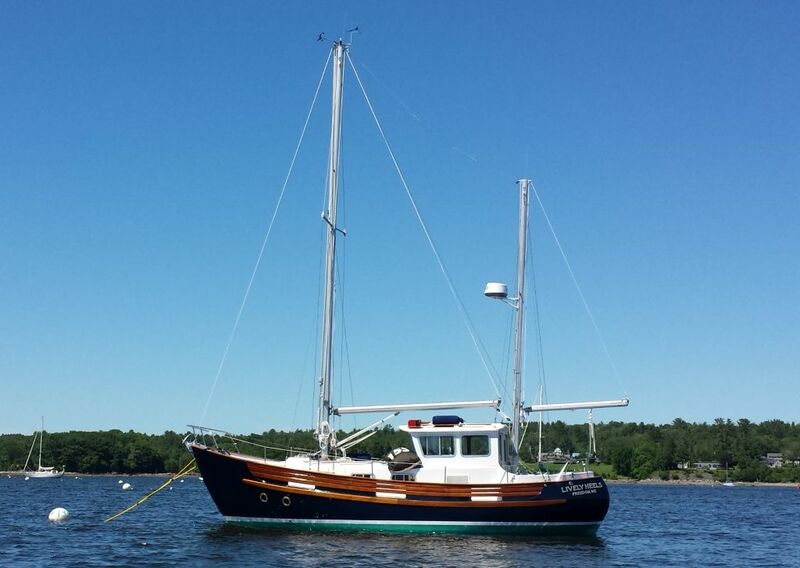 ), I completely rebuilt the boat, finishing the final details in June 2015 for a new owner after I decided, with much thought, that our own situation had changed substantially enough that we could no longer properly use and support the boat, despite the efforts and expenses of the restoration. In the History section, you can read a little about the people behind this, and the events that led to our choosing this Fisher 30, as well as why, near the end of the project, we chose to sell the boat. In the Project section, you'll find detailed logs for each day worked as the job progresses. This is where the action is, and where all the new updates will occur for the foreseeable future. This project began on 26 August 2010. It ended on 24 June 2015 with the launching and after 1821.5 hours of work. Site design and content ©2010-2015 by Timothy C. Lackey. All rights reserved. Please notify me of broken or missing links or other site issues. You can always find every day's project log links on The Project page.